A Jesse window is a visual representation in stained glass of the family tree of Jesus Christ, showing some of his ancestors as far back as Jesse. The Jesse Tree has been depicted in almost every medium of Christian art. In particular, it is the subject of many stained glass windows and illuminated manuscripts. It is also found in wall paintings, architectural carvings, funerary monuments, floor tiles and embroidery. The inspiration for the whole concept comes from the prophecy of Isaiah (chapter 11, verse 1) “And there shall come forth a rod out of the stem of Jesse, and a Branch shall grow out of his roots”. 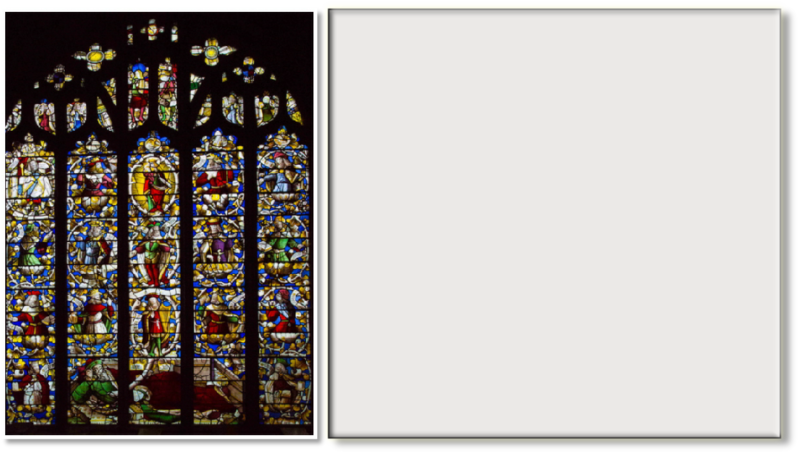 The artist who created the Llanrhaeadr Jesse window is unknown, though its date of completion, 1533, can be seen at the very bottom of the fifth light. The figures resemble 'court' playing cards, which took their form at about the time the window was made. It is believed that the window was removed for safety in 1645, at the time of the Civil War , and replaced in 1661, during which two of the figures - Achaz and Ezekias (second and third up from the bottom, in the left-hand light) - seem to have been transposed: the branches in these two panels don’t “grow” correctly from the adjoining panels, and the symmetry of the figures has not been preserved (the stance of Matthan at the top of the second light, for instance, mirrors that of Ozias at the top of the fourth light, whereas Achaz, who is third from the bottom of the first light mirrors Salathiel, second from bottom of the fifth light, and Ezekias, second from bottom, mirrors Zorobabel, third from bottom). In its present state, the Llanrhaeadr Jesse window has 23 identifiable human figures. For more information about the window’s history, there is a booklet available to buy in the church: “The Llanrhaeadr Jesse Window - its meaning and history” by E. Gwynn Matthews. You can also move the mouse over the figures in the window on the left to see who’s who in the window, then click for a larger version, and more information about each one. We are indebted to Bishop John Davies for much of the information on the figures in the window.